Welcome to the World of Dance!!! The tango is a late nineteenth century, Argentinian dance form. People know the tango for it’s seductive, sexual relationships between male and female partners on the dance floor. What people do not often see represented in this dance form are the underlying class and status struggles experienced by the original tango dancers. For women within the Argentinean lower class, the tango was about more than sexuality. It was also about oppression. Many females who were good tango dancers used their ability to enhance their prostitution clientele. Some women chose to become prostitutes as a route to escape the depths of the lower class life. Women could not gain any social status unless they utilized the resources of their male counterparts. theory women who were good dancers were hired by wealthier men who would get them out of the slums to a better economic status. For a lucky few this plan worked out to an extent, but for many this was not the case. For most women the best they could do was just pray and hope for more, with little results. The creation of the tango was influenced by a combination of three factors, the immigrants at the edge of the city, el compadrito, and el lunfardo. It all started after years of internal turmoil as Argentina was working hard to unify and industrialize. Immigrants flocked to the outskirts of Buenos Aires, after the 1870’s, in search of a better, more prosperous life. Many were left feeling hostile because they had not improved there economic status with their move to Argentina, as they had hoped. Along with the environment, the tango was affected by the male figure of el compadrito. This was a man who helped the underworld of Buenos Aires flourish through leading by example. He was known for being a pimp, robber, and bully. El compadrito visually mimicked the wealthy by wearing the rings, perfume, clothing, and practicing the physical stature of those people. In the brothels of Buenos Aires in 1880, el compadrito created the tango choreography based off of his attractions, to women in particular. The El compadrito also had their own unique vocabulary called el lunfardo. El lunfardo, coming from los lunfardos, or professional thieves, was used for the lyrics found in the music of the tango. People looked up to this powerful Argentinian lower class figure and continued to follow him through the development of this dance and music style. The stories visually and vocally articulated in the lyrics of the tango came from the miseries and sexual desires of the lower class community. Tangos “are public displays of intimate mysteries, shameful behaviors, and unjustifiable attitudes.” Choreographically, dancers are first taught the basic steps and are then given artistic license to perform the basics in any order they please. 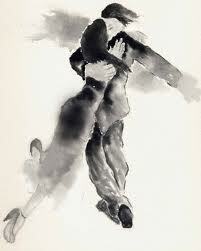 The tango depicts a strong heterosexual relationship where the male has power leaving the female to be submissive. With this relationship, the male always leads while the female follows formulating her moves in accordance to her partner’s. Held in a tight embrace, both dancers have an elongated, immobile upper body, that is tipped slightly forward. All the while smooth footwork is happening with the legs as the dancers glide through space. From an observer’s point of view, the female appears totally overpowered by the male as he leans over her. As he advances through space, hardly ever receding, she is forced to follow. 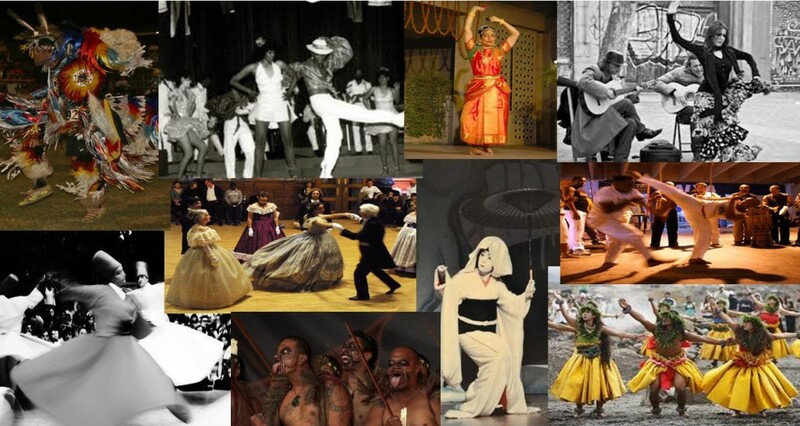 ← The Biyelgee – Mongolian Folk Dance or Modern Dance Form?